Both PCAST (President’s Council of Advisors on Science and Technology) and NAS (National Academies of Sciences) have recommended that OTC hearing aid (over-the-counter) sales be permitted for mild-to-moderate hearing losses. Additionally, the SB 9 Over-the-Counter Hearing Aid Act of 2016 introduced by Senators Warren and Grassley Senate Bill further requires that the FDA (Food and Drug Administration) remove the “normal hearing” restriction on Personal Sound Amplifier Products (PSAPs), and would override the restrictions in all 50 states. * (correction at end). With the decision directing the FDA to allow hearing aids to be available via OTC sales, the reality is that many of the instruments currently identified as PSAPs (personal sound amplification products) can also legitimately be identified as hearing aids. That identification is essentially up to the producer of the product. Or, as some are now doing, producing exactly the same product, but labeling one as a hearing aid, and the other as a PSAP, obviously looking at different markets for the same product. Of course, final FDA procedures relative to performance standards and labeling of OTC devices are not yet defined, but are suspected to consider recommendations made by the Consumer Technology Association PSAP Quality Standard Committee, which is suggesting a number of restrictions for PSAPs greater than required of hearing aids1. What follows is a discussion of the first of the five concerns (listed above) that hearing professionals have argued would result in dissatisfied users of OTC products. What is a professionally-fitted hearing aid? It would seem difficult to exclude otolaryngologists, even if they have no hearing aid fitting experience or license, because it could easily be argued that they are the ultimate hearing professional. It is noteworthy that often comments by hearing professionals citing personal experience stories about poorly-fitted OTC or other non-traditional sales, state this as being related to unqualified individuals, or to no individual performing the fitting. This casts light on their unstated assumptions then, that all fittings by hearing professionals are uncontested. If this were only the case. Unfortunately, there is no factual agreement as to when a hearing aid fitting is optimal. If there were, such discussions would be more meaningful. In truth, the final decisions as to whether hearing aids are useful and worthy of being worn, are relegated to the users, not to anyone else. As a result, it may be easy and sound reasonable to say that a hearing aid should be fitted professionally, but it appears that this statement will involve a serious discussion of what/who this involves. Additionally, recent comments make it clear that the number of “professionally qualified” individuals is not growing at a rate to keep up with the demand for hearing amplification needs2,3. Does having a hearing professional involved increase consumer purchasing decisions? The action of visiting a hearing professional for hearing loss solutions is often cited as of major importance in the selection and fitting of hearing aids. To this end, suggestions and attempts have been made over the years for audiologists to actively provide potential users information about the importance of hearing and visiting hearing professionals for proper evaluation, counseling, and fitting to make consumers more knowledgeable purchasers of hearing aids. The question to be asked is, what is the impact of visiting an audiologist? A recent report might provide some insight into this issue. A 2015 survey conducted by the Northwestern University’s Kellogg School of Management’s Experiential Learning Initiative, sheds some light on how successful such promotional efforts may have been5. They surveyed 328 persons over 55 years of age, who were perceived or diagnosed as having a hearing loss, and who were interested in finding a solution for their loss. The study provided information as to how effective the role of the hearing professional was from a consumer point of view. Figure 1. 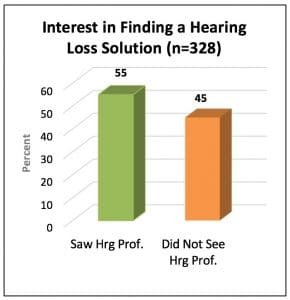 In a survey of 328 individuals who were perceived or diagnosed as having a hearing loss, and who were interested in finding a solution for their loss, 55% had sought the advice of a hearing professional, whereas 45% had not4. Of the 328 persons involved in the Kellogg/NU survey, fifty-five percent had seen a hearing professional, and forty-five percent had not (Figure 1). Keep in mind that this was a survey of individuals perceived or diagnosed as having hearing loss and had an interest in doing something about it. Does Contact with a Hearing Professional Influence Consumers’ Decisions to Purchase Hearing Aids? Frequent rhetoric espouses the importance of seeing a hearing professional when it comes to amplification. But, what impact does this have on the consumer? Up to this point, if this has been measured, it seems to be escaping documented published commentary. However, the Kellogg/NU survey provides data on the success rate of hearing aid purchase following a hearing professional visit (Figure 2). 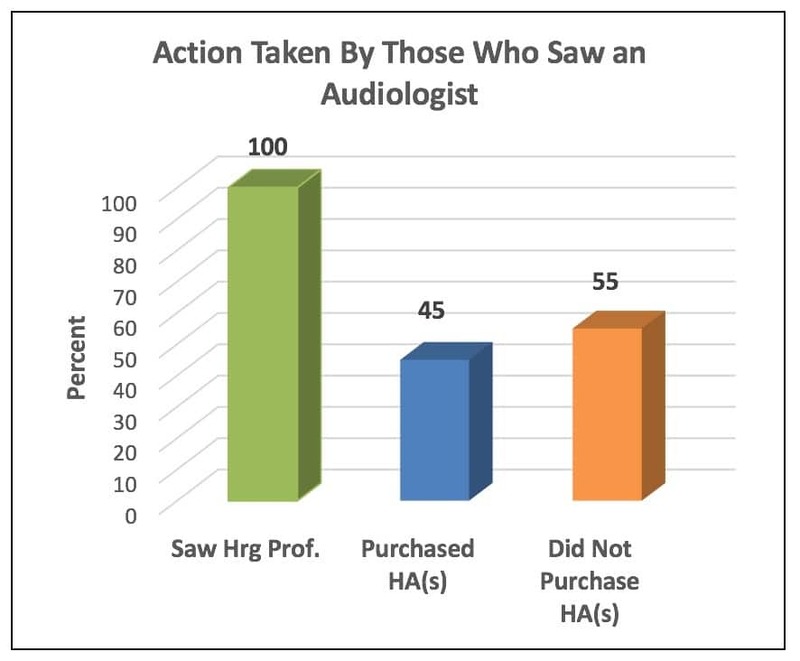 Forty-five percent (81 individuals) purchased hearing aids resulting from their professional visit, 55% (99) did not. 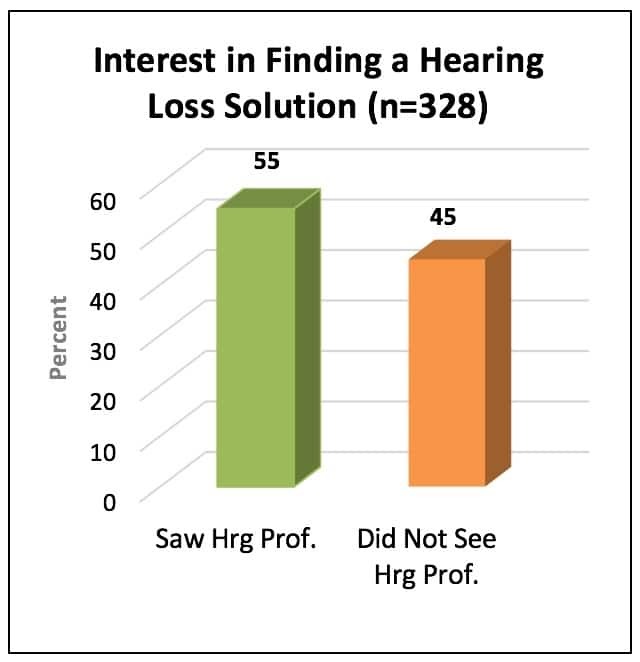 Of the remainder of patients who reported that they were interested in finding a solution, 45% (81) did not seek the counsel of a hearing professional. why did 55% who then were interested in finding a solution not seek the counsel of a hearing professional if that is seen as the “enlightened” way? Figure 2. Hearing aid purchase performance of individuals who saw a hearing professional. (Kellogg/NU Survey, 2015. n=328). Perhaps the real reason may not be known, but a factor that weighed heavily in the decision not to purchase, even after having been seen and counseled by a hearing professional, related to cost. This seems to be somewhat at odds with other published information expressing that cost is not a primary reason for non-purchase5. Perhaps the result differences reflect the way the question has been asked, and reported. In the Kellogg/NU survey, cost was listed as the number one reason (60%), but 80% of the patients cited cost as being too expensive (Figure 3). It appears that cost continues to be a reason for non-purchase, even when presented from a hearing professional office. Figure 3. Cost was cited as the number 1 reason by those who saw a hearing professional and decided not to purchase hearing aids (60%). Overall, 80% commented that hearing aids were too expensive. So, seeing a hearing professional and being counseled by such, was not sufficient cause for more than half (55%) to not purchase. Why did 55% who then were interested in finding a solution not seek the counsel of a hearing professional if that is seen as the “enlightened” way? This post cannot provide the answer to that question. However, it might be speculated that some individuals with a hearing loss are not prepared to make a commitment with a capital “C,” (primarily as seen to be associated with professional services) but might possibly try making a commitment with a small “c,” (OTC) especially if they have doubts about whether they want to try amplification or not. They may see the risk factor between the two as something they are able to manage. Poor experiences by the purchaser will discourage them from seeking additional assistance and purchasing a “real” hearing aid. Killion, MC. and Gudmundsen, G. (2016). New CTA PSAP quality standard. ADA Audacity Conference, San Diego, CA, 11/12/2016. Freeman, B and Windmill, I. (2017). Demand an Audiologist, but will there be one available? February 7, 2017. http://hearinghealthmatters.org/hearingeconomics/2017/demand-audiologist-will-one-available/. Hosford-Dunn, H. (2017). Supply and Demand in the Audiology Labor Market, Part 4, February 21, 2017 http://hearinghealthmatters.org/hearingeconomics/2017/supply-and-demand-of-audiologists-part-4/. Anderson. (2015). Market Research Study commissioned through Northwestern University’s Kellogg School of Management’s Experiential Learning Initiative, 2015. Valente, M., and Amlani, A.M. (2017). Cost as a barrier for hearing aid adoption. American Medical Association. http://jamanetwork.com/journals/jamaotolaryngology/fullarticle/2627924. What is a HA (hearing aid) and what is a PSAP? Review Guidance and finalize in 2014. Normal hearing restriction – nothing said about restricting this in the 2013 guidance. (c) New guidance issued. —Not later than the date on which final regulations are issued under subsection (b), the Secretary shall update and finalize the draft guidance of the Department of Health and Human Services entitled, “Regulatory Requirements for Hearing Aid Devices and Personal Sound Amplification Products”, issued on November 7, 2013. Such updated and finalized guidance shall clarify which products, on the basis of claims or other marketing, advertising, or labeling material, meet the definition of a device in section 201 of the Federal Food, Drug, and Cosmetic Act (21 U.S.C. 321) and which products meet the definition of a personal sound amplification product, as set forth in such guidance. 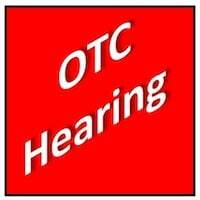 No state hearing aid regulations are going to be overridden that are not in the OTC category. FDA will enforce whatever definition PSAP turns out to be. The language of the bill is very narrowly written to apply ONLY to a new category of OTC hearing aids. That is, states cannot require that consumers buy an OTC hearing aid from a licensed professional. They may, however, still require that consumers buy other hearing aids from a licensed professional. Only those laws that prevent OTC sales will be preempted, and only with respect to OTC hearing aids that are approved by FDA. Generally applicable consumer protections are unaffected, such as warranty provisions and return periods. State licensure laws will still be applicable to sales of traditional hearing aids. (4) EFFECT ON STATE LAW.—No State or local government shall establish or continue in effect any law, regulation, order, or other requirement specifically applicable to hearing products that would restrict or interfere with the servicing, marketing, sale, dispensing, use, customer support, or distribution of over-the-counter hearing aids (as defined in section 520(p) of the Federal Food, Drug, and Cosmetic Act (21 U.S.C. 360j), as amended by subsection (a)) through in-person transactions, by mail, or online, that is different from, in addition to, or otherwise not identical to, the regulations promulgated under this subsection, including any State or local requirement for the supervision, prescription, or other order, involvement, or intervention of a licensed person for consumers to access over-the-counter hearing aids. When disposable hearing aids were available through audiologists in the early 2000s we learned two things. 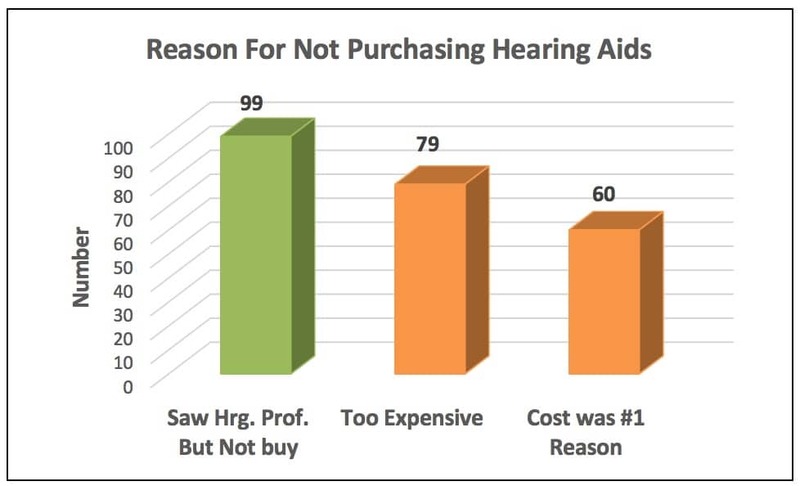 One, consumers were more willing to try an aid, as the cost (then $40) was not a big hurdle and two, the average age of a disposable consumer was much younger than a traditional hearing aid buyer. While this data is unpublished, it does suggest that the OTC market may affect usage earlier in life thereby encouraging consumers who need the product to try it and use it. It also suggests that the mainstream hearing market may rather reap the benefit of an increasing number of users as they look with greater comfort to investing in a traditional product. Hearing aids have changed beyond recognition with the digitalisation of the industry. And yet the model for acquiring an aid is the same as it was back in the days of trimmers and the likes. This is an industry in need of change. Watch this space.